Cooler Master has long been known for high end and enthusiast level computer cases. In recent years, they have made a push into the CPU cooling market, providing a wide range of products for just about any price point. While companies like Thermalright have been a dominating force in socket 775 air cooling, Cooler Master is looking to change that for socket 1366 with a hybrid TEC air cooler called the V10. Sticking with the engine theme that they started with the V8, the Cooler Master V10 is an incredibly massive heat sink they claim is capable of dissipating 200+ Watts of CPU heat. With 10 heatpipes, 6 of which are dedicated to the CPU, and a 70w max TEC Cooler Master is hoping to supplant the reigning air cooling champion, the Thermalright Ultra Extreme (or TRUE). The Cooler Master V10 also makes the Cooler Master V8 CPU Cooler that we reviewed last November a bit dated. Measuring in at 236.5 x 129.6 x 161.3 mm, it's easy to see that this thing is a monster! 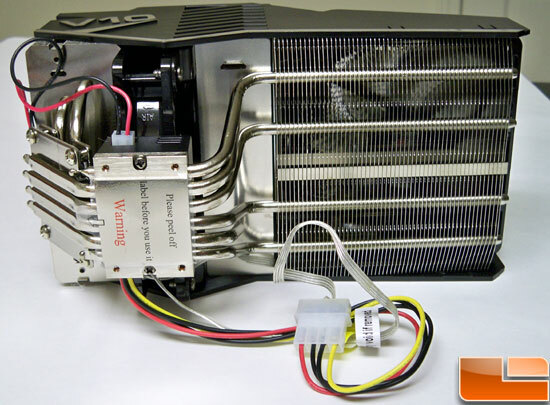 The V10 packs in dual 120x25 mm 4-pin PWM fans that are capable of up to 90CFM! Cooler Master has ensured great compatibility with a number of CPU's, with mounting hardware for LGA 1366 & 775, as well as AMD 754, 939, 940, AM2+, and AM3 sockets. The V10 is designed to not just be a great CPU cooler, but to also cool other components in your system, the most obvious is RAM. Cooler Master has done their homework, leaving enough room under the V10 to accommodate Corsair's Dominator RAM. Unfortunately taller RAM heat sinks have been released, namely by Kingston in the form of their HyperX T1. These memory sticks will not fit under the V10 so if you were dreaming of this combo, as I was, then you are going to have to find different solution. In addition to cooling the memory the V10 helps cool the VRM's around the CPU socket. Combined with a case that has a large fan on the top there should be no problem keeping the critical parts of your system cool. Today we will be comparing the performance of the V10 against the TRUE on a Core i7 920 LGA 1366 platform, and on LGA 775 against the Thermalright Ultra-120 eXtreme and Xigmatek HDT-S1283. The Xigmatek is a heat sink that offers tremendous bang for the buck and is quiet in operation. While not an ultimate performer, in certain situations it can cool close to what the TRUE does with a low CFM fan. But before we get into performance we are going to take a closer look at what the V10 is all about.